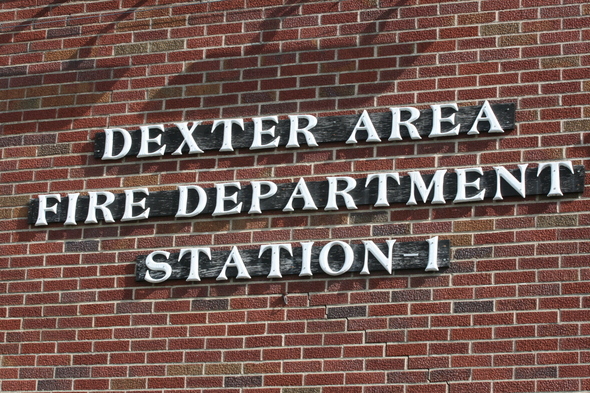 Posted on Wed, Mar 21, 2012 : 5:43 p.m.
Lettering on the side of the Dexter Area Fire Department Station 1 on Main Street in downtown Dexter. A specially made $1,000 tarp that covers fire hoses on the Dexter Area Fire Department's Engine 5-3 is missing. 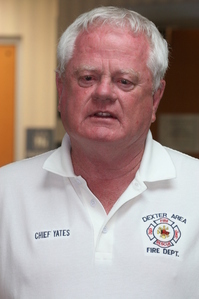 "We believe it was lost between Station 2 on North Territorial Road and Dexter Townhall Road in Dexter Township when firefighters were out on a call during last Thursday's tornado," said Fire Chief Loren Yates. The forest green tarp, which has faded a bit during the years, was specially designed for that engine. "Each truck is a little different," Yates said, adding that it has special snaps on it and is usually chained to the back of the engine. The department realized the tarp was missing on Sunday, he said, and it would really like to get it back. Engine 5-1 also "lost a window" during the rescue operations, Yates said. If anyone finds the missing tarp, Yates asks that they call the fire department at 734-426-4500, and "We'll come get it," he said.